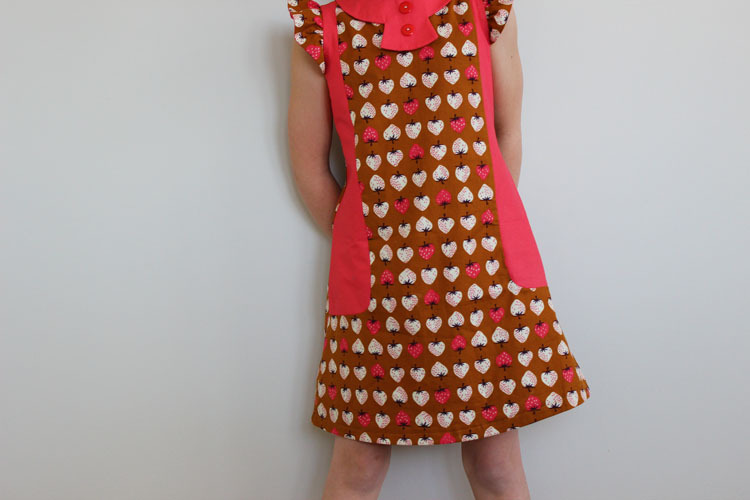 This dress has been sitting half sewn in my sewing room for a couple of weeks now. I needed to trial the zip guard on my Cosmo dress pattern last week and this was my test dress! I fell in love with this gorgeous print the moment I saw it. Designed by Kimberly Kight for Cotton and Steel and purchased at Miss Matatabi. Unfortunately it is not in stock there anymore but you can find it here. 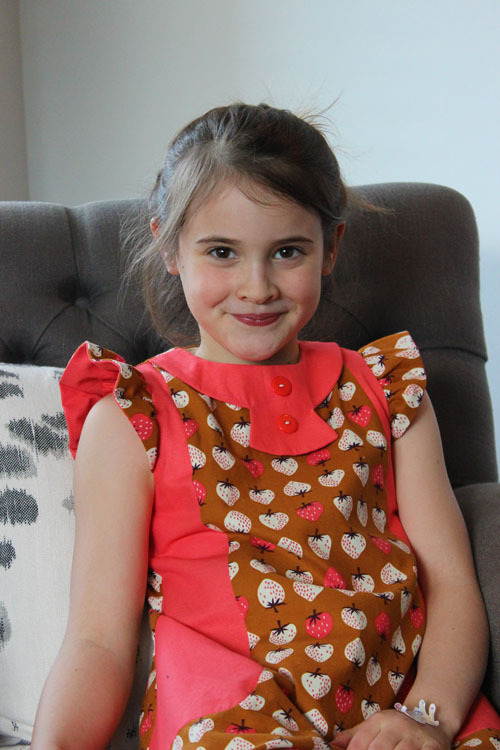 The sweet fabric sat in my sewing drawers for a few months until I decided to turn it in to a fun strawberry Cosmo dress for Juliette! 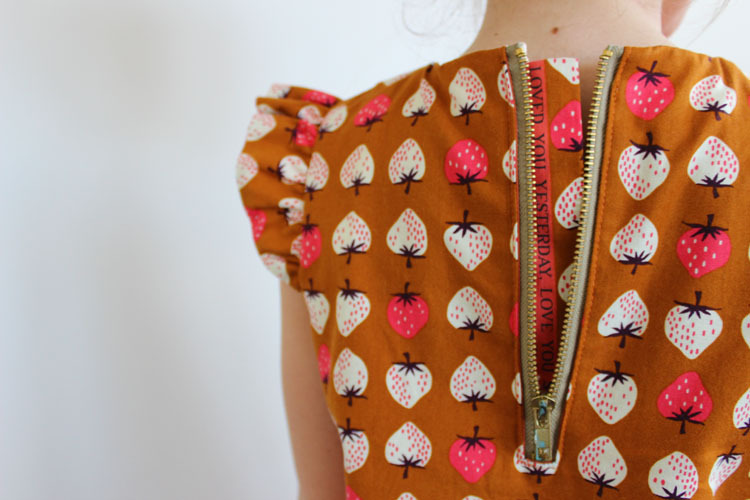 I must say, I really love installing the exposed zip in the Cosmo dress! It is really satisfying and adding the zip guard, makes the dress look really professionally finished. It also means that the zip isn't cold on the skin. I really love brown prints! I paired the brown strawberry print with some coral pink I had in my stash. 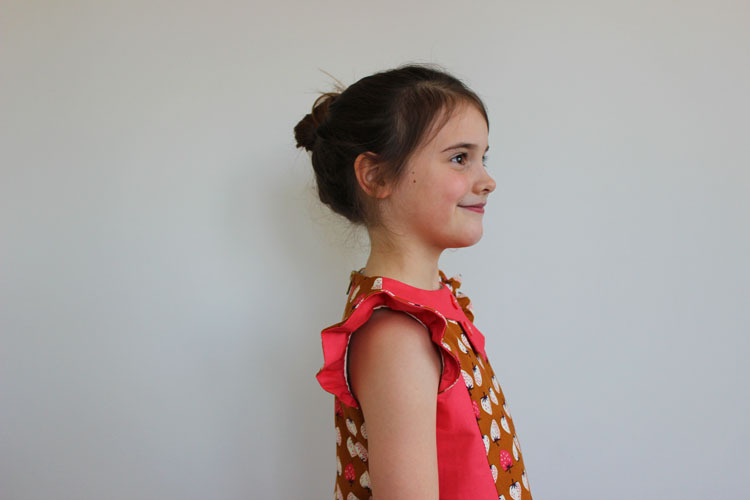 I used the medal collar for this dress and the flutter sleeves. It was too cold this week to take good photos outside so we visited my sister who lives very close by for some more cosy photos!. 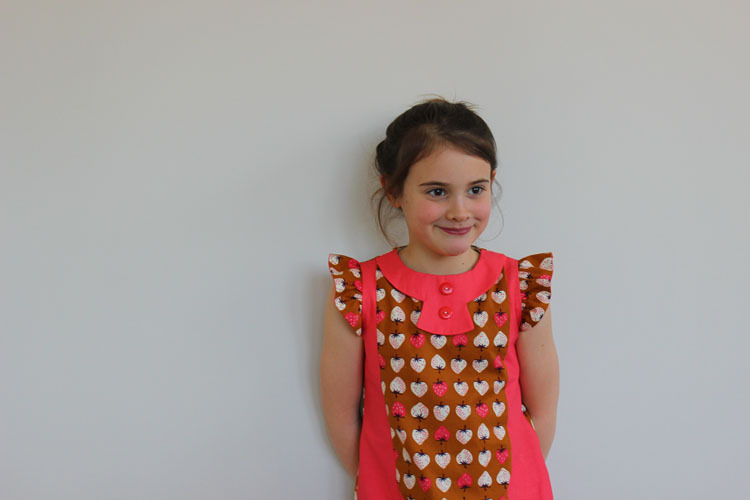 Juliette has still been wearing this dress with a cardigan and tights and she loves it! 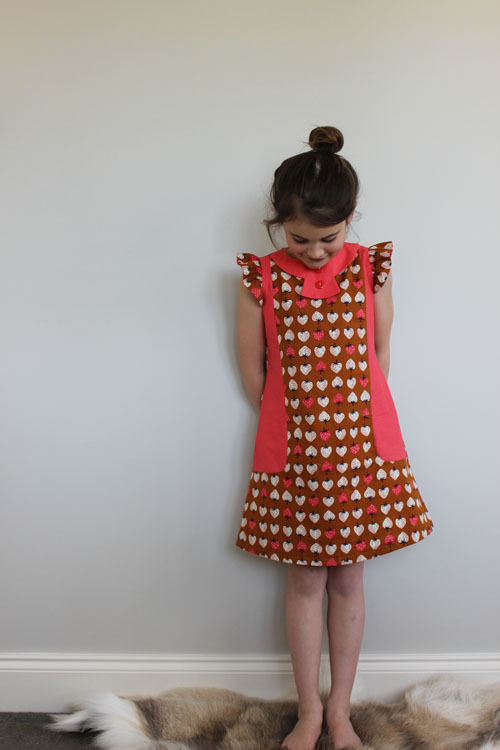 I am really so glad she still loves wearing dresses because I love making them so much! Juliette told me today that this is her new favourite dress. 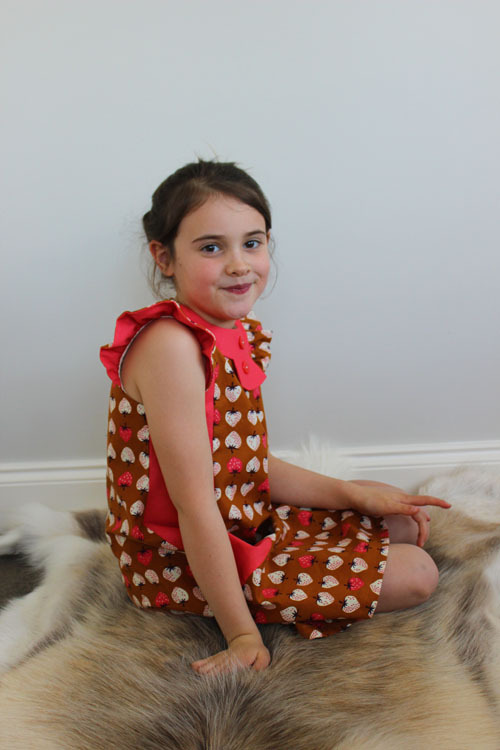 Then she proceeded to say that each new dress that I make her is her new favourite! That works for me! 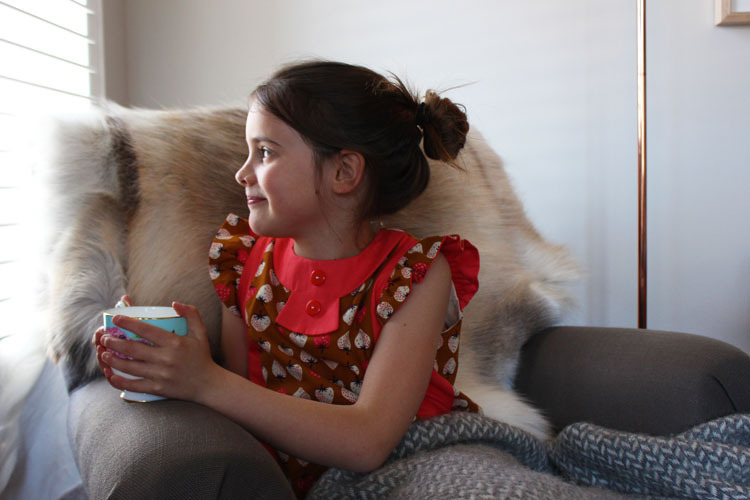 After taking these photos at my sister's place, Juliette requested a cup of tea...she takes after her Grandma and loves a good cuppa! Thanks ! I don't mind either! This is such a sweet dress! What girl doesn't love strawberries, right? And the colors are so pretty! Big fan of these strawberry dress! !